The first feature that attracts your attention to the Netgear Nighthawk X6 is its three distinct Wi-Fi bands with varying frequencies and speed limits. It has one 2.4GHZ (600MBPS) band and two 5GHZ (1300MBPS) bands installed within a single hardware architecture. You can configure them individually according to your specific gaming and video streaming needs. It supports Ethernet ports, Wi-Fi Antennas, and the USB 3.0/2.0 ports for the maximum performance and speed. The advanced gaming ranges you can play on the Nighthawk X6 are very vast. The router’s easy configuration lets you customize the settings to enable speed and zero lag playing experience. You can do it with the help of port forwarding or port triggering methods. They allow you to configure the gaming server visibility, multiple devices gaming, and the opening of incoming and outgoing ports. You may also use the router as a virtual server for connecting to the LAN and internet users for the multi-player games. The first time you play the XBOX game on the Nighthawk X6, it amazes you with its speed and accuracy. The best way to play this version of the game is to hard wire the gaming console to the router’s Ethernet or the USB port. The initial loading time for the game could be more when the device’s hardware compatibility is relatively lower compared to the router capacity. But once the multiplayer games get loaded, you can play them at the maximum possible speed allowed by the device’s hardware setup. The main attraction of the online VR games is their 3-D HD video rendering effect. The maximum screen resolution can go up to 1920X1080 for the basic level games. For the advanced versions it may reach up to 3840X1920. The frame rate of the game is also higher than 90FPS. The added features are the first person gaming experience, teleporting, and the other advanced features. Getting all of them (or at least most of them) onto the PC or laptop from the internet requires lot of bandwidth, speed and lag free bands. The Nighthawk X6 is the one router which can be compatible with most of the VR gaming features you expect. The Nighthawk X6 is best rated for its multiplayer online games like the FPS, sports, flying and the racing versions. Once you configure the ports and static IP address on the router, it is possible to get the best gaming experience live on the internet. The Nighthawk X6 has the best video streaming capacity for the 4K HD videos. Surprisingly, the distracting effects of lags and audio-video mismatches are rare or very few. You may hard wire the Ethernet or the USB port to the smart television, or choose the Wi-Fi connectivity. There is no significant difference between the two types of connections, except perhaps the speed. Live online video conferencing is one of the top features supported by the Nighthawk X6. You may connect it to the smart phones, tablets, PCs, and laptops to get the free flowing experience. The Nighthawk X6 is driven by a 1GHZ dual core processor which makes the dynamic QOS possible based on twin criteria of application and device. The optimizations make the router much more practical in is design, since you can configure the settings independent of the hardware and software features. The beam-forming technology of the router makes it focus on specific devices in the network to precision. Increase in speed and accuracy are the primary benefits you get. The other advantage is the increased concentration of Wi-Fi signals and data packets. The recipient device can work at its maximum efficiency range without any significant loss in the data. It also ensures zero lagging when it comes to advanced gaming and video streaming features. The Nighthawk X6 gives you the maximum range of coverage for the Wi-Fi devices in your home. The six power packed antennas can amplify the incoming signals multiple times to deliver the best results. There are no interferences for the smooth working of the router to give you the best file sharing, mailing and downloading options. The router can handle huge multimedia files, database files, and zipped files with no hassles. If you wish to get the best befits of downloading games from the online stores, it is better to dedicate one of the 5GHZ bands for the application. The time consumption will be significantly less compared to the other models of the routers with similar configuration. It is made possible by the dynamic QUS features within the single bandwidth and speed range. The 1GHZ dual core processor has the best performance features for the intelligent QOS and the prioritization of data forwarding and processing. When you use the Nighthawk X6 with your PC, the task of the computer’s processor is reduced by more than 40% due to the router for the internet related activities. Hence, the PC /laptop give you the maximum performance within their hardware configurations. The processor is designed to split the data packets individually for the three bands. It knows how to switch between the multiple applications running on the same band, while keeping the other bands independent of the load. The user interface on the Nighthawk X6 is perhaps the simplest you can find among the modern routers of 2018. Once you install the router and configure the basic features through the wizard, it opens up the control panel for you to make additional settings. You can set the language, shortcut keys, time zone, QOS scheduling and type, beam-forming, signal strength management, etc. The Nighthawk X6 is highly compatible for the Windows, MAC and Linux server systems. You can use the directory services in the windows server to secure and restrict the accessibility. 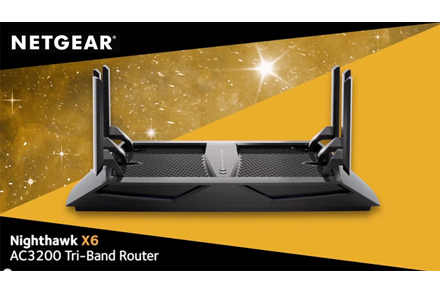 The Nighthawk X6 is one of the most cost competitive tri-band routers you can find in the market today. It delivers more than what you pay for it in the in the long term usage for your home and office needs.